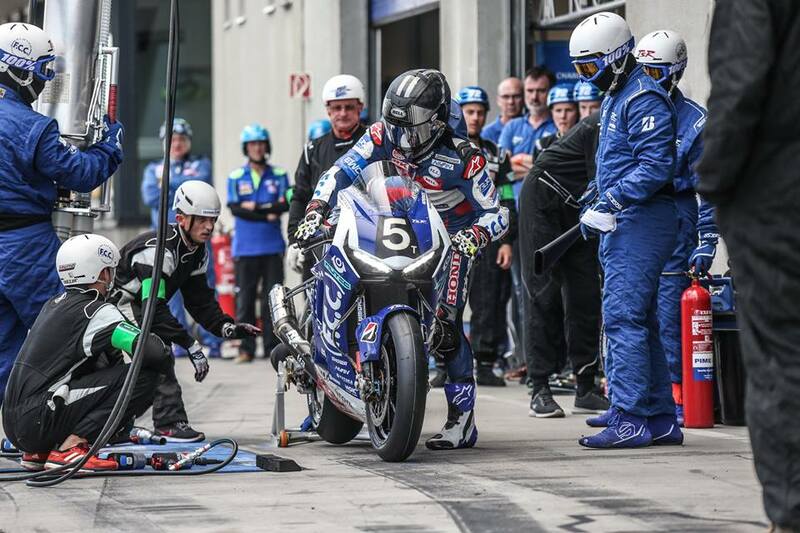 After making a sensational return to premier class racing last season, it hasn’t taken long for Bridgestone to make an impression in the FIM Endurance World Championship. Earlier this season, the Japanese tyre maker claimed their first win in the series, as FCC TSR Honda claimed victory at the 24 Heures Moto in Le Mans. One month later, Yamaha Austria would go on to take a comfortable win at the 8 Hour of Slovakiaring as Broc Parkes, Marvin Fritz and Max Neukircher finally converted their good form into a top-step finish. The penultimate round of the 2017/18 season took place this weekend at Oschersleben, as part of German Speed Week, with both Bridgestone supported teams looking for another maximum points haul. Unfortunately for YART, who were 2nd at the half-way point, things took a turn for the worse when a somewhat innocuous looking crash led to a bike fire and their retirement from the race. At the 4 hour mark, there was less than 3 seconds between YART and race leaders FCC TSR, both using off-the-shelf Battlax V02 Slicks. Freddy Foray, Josh Hook and Alan Techer worked hard to keep the Honda in the lead from the half-way point, and clever fueling strategy helped the team to make one less stop than their rivals too. Heading into Suzuka, the chase for the title is very much a two horse race, with FCC TSR holding a 10 point advantage over GMT94, who came 3rd in Germany at the weekend. Bridgestone have a superb record on home soil, with a winning streak lasting more than a decade at the famous 8 Tai, but with so many local teams taking part for one round only, it’s still all to play for when it comes to the regulars. Find out more about the Bridgestone race range here.